Sadly, in the light of current conflicts in a number of places in the world, the need to call on humanity to eschew war and conflict for ever has to be repeated. Fortunately for the world, and for those caught up in the violence and its effects, citizens around the world are making the right choice: turning their backs on war, and welcoming those fleeing from it. 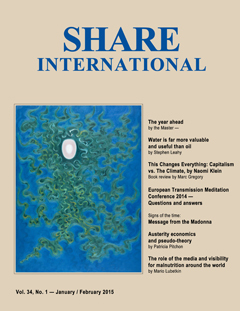 Share International has decided to reprint this article by Benjamin Creme’s Master written in 2004 knowing that more and more people see that “further reckless strife is useless and dangerous” and are “demonstrating their choice for life and happiness”. Q. Please, if possible, give a little indication and a bit of hope in a rather depressing time for the world: Are people responding well to Maitreya and His advice? Q. I observe that Venus, Mars and Jupiter all are aligned at present; I hope this is a good influence for our poor planet which seems in dire need of all help possible now? A. The position of these planets is not accidental. They have a powerful bearing on the life of this planet and at the moment their influence is essential and good. Q. Do you think the migrant crisis and all the other major issues which seem to be reaching a crescendo of urgency could be described as a pivotal Sword of Cleavage period in the world’s development? A. Yes it could be so described. Q. I really would like to know if the influx of immigrants into every country is part of a plan by the Masters? Q. I notice that dates have been mentioned in a couple of recent letters, one giving a specific date for when “Maitreya is coming”. But I noticed Mr Creme didn’t comment on the date. Could you possibly explain why there was no comment or confirmation of the specific date given by a spokesman? A. A ‘spokesperson’ may not necessarily be absolutely accurate. Such indications are meant to waken up the ‘lazy ones’. Maitreya does not give exact dates; exact dates depend on so many factors coming together. Maitreya Himself probably does not know the exact date, although He has said the ‘time is set’. Q. In the latest issue of Share International magazine there was a letter (Great Expectations) about ‘visualising’ the audience expected at lectures. We wrote the letter and would just like to point out that we also advertised, made flyers and put the usual amount of energy into the normal work of advertising events. We were not suggesting that all that is needed is to ‘hope for the best’ in a passive way. Thank you. A. Yes. Every effort is worthwhile because you don’t know in advance whether there will be input or not from the Masters. Q. I understand there will be a worldwide economic collapse some time around the end of this year 2015 (Share International, March 2015). Does that mean that the world as we know it will come to an end very soon, or will Maitreya stop it from happening? A. No. It does not mean that at all. We refer to an economic collapse. Q. If the start of the changeover to the new system starts around the end of 2015, and the Day of Declaration is at the beginning of 2017, then presumably the world will deteriorate rapidly during 2016. Can we expect WW3, disease epidemics, food/ water/ oil shortages, power cuts, rioting etc? A. Hopefully not. Certainly no World War 3. The above is exaggeration. It may simply be difficult for many people. Q. (1) Is the Master Jesus a current Cardinal of the Catholic Church? (2) Will the Master Jesus (who will not call himself a Pope) work together with Pope Francis to unify all humanity/religions? A. (1) No. (2) The Master Jesus works on a world scale. This includes the Pope and other religious leaders. I would like to share an experience that happened on 15 February 2014 in Paris. I came out of a restaurant at night, around 10.30pm with my boyfriend and two friends. We were bringing our friends in front of the Paris metro. On our walk towards the metro, I saw a violinist sitting playing a beautiful melody in front of the entrance of the metro, with his case open to receive money. I never saw him before there, though I have lived in this area for many years. He was a 40-something white man, with very, very white hair and skin, almost like an albino’s, wearing a very bright green beanie [woollen hat]. What struck me was that it was so late for him to play, and it was very cold and windy in the place he was sitting. Arriving next to him, in front of the subway, I had a very strong and intense feeling. My heart was beating hard. I had an irrepressible desire to give him money. When I gave him the money, he closed his eyes while lifting his head. I joined my friends in front of the subway, and then I saw written on one pillar of the subway “Have a nice day” and on the other pillar written “You are loved” – strange, as it was written in English. I looked at the violinist again, he was staring at me intensely. It was like in a dream, a bit foggy, with a very strong and intense feeling. That very night, I dreamed about what happened very intensely. I came back there a few days later to take picture of the two inscriptions, and they weren’t there anymore. Could Mr Creme kindly let me know if this man was somebody special? And who has written these very positive words? Thank you very much in advance, and thank you for what you are doing for the world. On 26 May 2015, Michiko Ishikawa gave a talk in Nagoya, Japan. During the intermission after the talk, a short man in his 70s opened the door that clearly stated ‘Staff only’, and came into the room. He said he was looking for a bathroom, so I showed him the way. Suddenly he said: “That’s exactly right.” I asked “What?” He said again: “That’s exactly right.” I realized he was referring to Michiko Ishikawa’s talk. He was quiet and did not say much, but gave me a lasting impression. On 2 October 2014, our group hosted a public presentation and something odd occurred which I would like to ask about. I was to give the talk but was delayed and arrived 10 minutes late. I was a little anxious, as I was anticipating a large crowd and didn’t want them to wait on my account. When I arrived, I was very surprised to find there was no one there! Our group was present and had done the setup, but there were no other people! We usually get at least a handful. I started to say there wasn’t any point giving the talk, when one person walked through the doorway. I quickly set up the microphone and took my place at the front of the room to start the talk. The man, who was in his mid-thirties, medium height, with curly, slightly long, black hair, dressed like a Western university student, looked over our free materials and picked up one of our glossy pieces about Maitreya and then made his way to the front row and sat down in an aisle seat. He was carrying a stack of newspapers in his arms, and after placing all but one on the floor to his right, he began reading one. I waited a few minutes, hoping more people would come, but nobody did. So, I began the talk. Throughout the whole talk, the man never looked up once and continuously read his papers, one after another. A couple of times he stopped and did things on his cell phone, only to resume reading. I found it very odd. I had given talks before to a limited number of people, but I’d never had anyone who didn’t look at me, or who didn’t seem to be listening at all! The young man spent the whole time reading his newspapers! I found it increasingly humorous and I started to have fits of controlled giggles. I found myself trying to engage his attention by talking about aspects of our ‘story’ that many people find ‘difficult’ (miracles, appearances of the Masters, etc). No matter what I said, there was still no reaction from him. Then I started trying to be really outrageous, by calling our Prime Minister an idiot and the current government a bunch of Fascists! Still, there was no reaction, although once I thought I did perceive his eyes lift a bit from his reading and a slight smile cross his lips. But, throughout the whole time, which was just under an hour the young man exhibited no response, or interest at all. I finished the talk, to applause from the group, but nothing from the man. He quietly collected his newspapers from the pile on the floor, and without a word left as silently as he had come. I commented to a co-worker that I found it an odd experience, and that the man must have accidently wandered into our event. My colleague assured me that the man had indicated he had come for the talk. I didn’t think much of it, other than it was a very odd experience for me and the group. But when I mentioned it to other co-workers in other groups, they all remarked that it sounded like either Maitreya or another Master, as I had fleetingly thought. Was the man someone ‘special’? If it was one of the Masters, why did he behave as if he wasn’t interested? Was my talk really that bad? The evening before I went to a lecture about the Reappearance of Maitreya, I saw a handprint on my microwave oven. At first I thought they were fingerprints, but I could not wipe them away with a cloth. The following day I went to the lecture not knowing what to expect. Afterwards we were given a photo of the ‘hand’ of Maitreya. That night I woke up and saw a connection between the print on the microwave and the photo, and I realized that it could not have been a fingerprint at all, because the markings fully concur with the photo. I went to my microwave to have another look, but could not find any trace of the prints. So far I have been practising Transmission Meditation only for a few times, so I do not have much experience, and would be grateful for some clarification. On a very hot day at the end of July 2015, five of us drove for about two hours to the town of Komagane in Nagano Prefecture to put up posters and flyers for a video showing scheduled there about a month later. Two members went by car to various city government offices in the area, and three of us began to walk around the town with our flyers. Shortly after we began, a drunken man in his 60s approached us, walking unsteadily with a cigarette in his hand, saying: “Isn’t there someplace where they will let me smoke?” Then he said to us: “I appreciate your work…. The people in Komagane are very nice, and I love this town.” So we handed him a flyer and asked him to please come to our video showing. He then said he came from Yokohama (quite a distance away). Looking at Mr Creme’s photo on the flyer, he said: “I know this man well. He was on TV yesterday, saying very good things.” Then he pointed to us and said: “I know you, and you. You have good faces.” After we talked a bit, he shook hands with us and went away, saying that he was going to drink some alcohol. To our surprise, every shop we visited gladly accepted our posters, the shopkeepers saying: “Thank you for your work.” Very quickly the town of Komagane was filled with Mr Creme’s posters. When we met up with our co-workers who went by car, they told us that the people at the city office as well as the tourist association office accepted all the posters, saying they would take care of distributing them. We felt as if a Master had spread magic powder over this town. Was the drunken man a special person who helped us do our work? I. M. and others, Aichi, Japan. On Saturday 19 September 2015 I was feeling a bit emotional and frustrated with my personality so I sat in my orgone accumulator and stared at Maitreya’s ‘hand’. I was feeling so tired of being astrally polarized and really wanted to work on changing that. So I asked Maitreya in my head, “How can I become mentally polarized?” I meditated on that for a while then left to do some postering for our upcoming Share International Expo. After an hour of postering I decided to go for a bike-ride while the weather was still good. It was a beautiful sunny autumn day with the leaves changing colour. As I was about to cross a walking bridge that leads to the river valley path, I spotted a lithe young man in his mid-twenties ahead of me. He had light brown hair pulled back in a ponytail, was tanned and shirtless with a bag over one shoulder and a guitar strapped around the other, and he was playing his guitar and rollerblading at the same time. I noticed people who passed him would smile, as he was quite something to see. As I passed him he smiled at me and said a cheery “Hi” and I wondered how he was going to go down the steep hill we were coming to – that surely he’d have to put his guitar away. But no, I could hear him playing his guitar behind me, gaining on me, and then passing me as he was playing his guitar and roller-blading down the steep hill. He kept on playing as he made it up the next smaller hill ahead of us. I was quite baffled at how he did that. I couldn’t help but smile as I kept riding behind him. I didn’t want to pass as I was just enjoying listening to him play and watching him effortlessly move along the path. Was that young guitar-playing rollerblader anyone special? In early 1985 I was travelling in a group overland from London to Nairobi. In Cameroon a friend became ill and she and I stayed at a local hospital while the group continued on. When my friend recovered we tried to catch up with the group. We spent our first night in a village where my friend lost her money. There was no public transport so we started to hitchhike on the quiet road. A large, air-conditioned German car stopped and the driver offered us a lift. The driver’s name was Yusuf, a quiet and calm man dressed in a flowing blue robe. We conversed in French. He took us to the border with Central African Republic where we stayed the night. Next day Yusuf took us on to the next town where we were reunited with our group who had been delayed by the authorities. Knowing about Maitreya and the Masters I have wondered in recent years if Yusuf was someone ‘special’. Please could your Master say? This cross of light was discovered in a pane of glass in the Greenwood Community Church in Elk, California by a local Share International co-worker in 1995 when he was checking to make sure the church’s lights were working properly. The church is used by the local Share International group for Transmission Meditation. This cross of light was one of three found in the church. Benjamin Creme’s Master confirmed that the crosses were energized by Maitreya when they were discovered. The panes of glass remain in the church – one mounted as part of a stained glass window display, and another mounted inside a box. During Transmission Meditation in the church, a light is turned on behind the panes of glass, making the crosses of light visible. Patterns of light photographed in Munich, Germany, in August 2015, sent by A. B. Patterns of light in London, UK, 22 August 2015, sent by F.D. Photo sent by M.T. of light patterns on a building in Philadelphia, July 2015. Patterns of light photographed in Toronto, Canada, sent by B.N. in September 2015. Mexico City, Mexico – On the night of the supermoon, 27 September 2015, a sequence of photographs shows a UFO next to the moon. Viviane Taham, from Brazil, whose daughter took the photographs, said, “My daughter called me at the time and said: ‘I saw a UFO, saw a UFO’. I do not know whether to believe in extraterrestrials. Never thought of that possibility, and had never seen anything like it.” Other sightings of UFOs near the super moon were also reported. George Tamaras filmed a UFO near the moon from Campo Grande, Brazil, as a bright white ball of light. A witness in Buenos Aires, Argentina, recorded several objects the same night including UFOs shaped like “cigarettes”. Two images captured by the Solar Heliospheric Observatory (SOHO) on 16 and 30 September 2015 show two gigantic objects moving close to the sun. “The Pope healed our baby’s heart,” says Lynn Cassidy of Phoenix, Arizona. Cassidy’s daughter Ave was born with Down’s Syndrome, various complications, and most seriously, two holes in her heart. During Easter 2014, the family visited Rome to see Pope Francis at St Peter’s Square during the canonization of John Paul II and John XXIII. As the motorcade approached Lynn’s husband held 3-month old Ave up in the air. “The secret service person, Johnny, stopped and took her from Scott and held her up to the Pope,” Lynn said. “The Pope asked my husband, ‘How old is she? What’s her name?’ He told the Pope she had two holes in her heart. When we got home in May, we went back to the cardiologist for a check-up. One of the holes was completely closed and one was half the size.” Some 18 months later, Ave is a happy baby with a healthy heart. John Paul II was canonized by Pope Francis in 2014. A small bust of John Paul has begun exuding a “mysterious healing oil”. According to its owner, Nelly Du Bois of Liedekerke, a town west of Brussels, Belgium, the statue began dripping oil about three years ago. A total of 146 countries, accounting for nearly 90 per cent of global greenhouse gas emissions, have submitted their national climate action plans to the United Nations ahead of the upcoming international climate summit in Paris in December 2015. If fully enacted, these greenhouse gas reduction targets would limit global warming to 2.7ºC by the end of the century, according to the Climate Action Tracker, an independent research organization. This is the first time since 2009, when the group began calculating temperature estimates from climate action pledges, that projected warming has gone below 3ºC. However, the collective commitments do not meet the internationally agreed-upon goal of a 2ºC increase. “The INDC (Intended Nationally Determined Contributions) process has clearly led to progress, but it is clear that in Paris governments must consider formally acknowledging that their first round of climate plans for 2025 and 2030 will not hold warming below 2ºC,” said Bill Hare of the Climate Analytics research group. “Governments must revise commitments from 2025 onwards to feasibly rein in climate change,” Hare added. Christiana Figueres, executive secretary of the UN Framework Convention on Climate Change (UNFCCC), said: “Over the past few months, the number of countries submitting their climate action plans to the Paris agreement has grown from a steady stream into a sweeping flood. This unprecedented breadth and depth of response reflects the increasing recognition that there is an unparalleled opportunity to achieve resilient, low-emission, sustainable development at national level. The UNFCCC secretariat will provide a synthesis report of all submitted plans before the climate change conference taking place between 30 November and 11 December 2015. The goal of the summit is to produce a legally binding, worldwide treaty to reduce greenhouse emissions, and limit global temperature rise to 2ºC above pre-industrial levels. An international campaign to limit global warming to under 2ºC has participants in more than 40 local, regional and national governments. Signatories to ‘Under 2 MOU’ (Under 2ºC Memorandum of Understanding), hope their actions will encourage world leaders to agree to a stronger global treaty at the UN climate summit in Paris in December 2015 when 194 countries gather to negotiate an agreement for greenhouse gas emissions reduction in the post-2020 timeframe. While there is optimism that a successful global climate deal can be reached, it is not expected that the collective ambition of major emitting countries will be sufficient to limit global warming to below 2°C, which scientists agree is necessary to avoid the most dangerous impacts of climate change. As of October 2015, Under 2 MOU has been endorsed by 43 jurisdictions from 19 countries and five continents, collectively representing more than 474 million people and $13.6 trillion in GDP. If the signatories represented a single country, it would be the second largest economy in the world. We present a selection of quotations on the theme of ‘The Reordering of Priorities’, taken from Maitreya (Messages from Maitreya the Christ and Maitreya’s Teachings – The Laws of Life), Benjamin Creme’s Master (A Master Speaks and Share International), and Benjamin Creme’s writings. So great are the tensions inherent in the vast differences in economic power wielded by the various nations that true stability is impossible to achieve. This being so, it is only a question of time before the whole shaky edifice collapses ignominiously. This will be the signal and the opportunity for a complete reappraisal of the economic priorities of the world. The needs of all peoples are the same: adequate food, housing, education and healthcare are the essential requirements without which men cannot reach, nor render to society, their full potential. Millions, today, are denied these basic rights. Responding to His stimulus, humanity will seek ways to implement the new directions which His presence will reveal, and order their lives according to a new and higher rhythm. In a short time, major inroads will be made into solving the many problems which afflict mankind today: hunger and oppressive poverty and the denial of basic rights; destructive competition among the nations and environmental decay; ethnic bigotry and the army of refugees which results; above all, the scourge of war. When men realize that these problems are solvable naught will for long delay their ending. With a will, men will tackle them one by one, with growing understanding of the urgency and the means. I shall show you that the way for man is the way of brotherhood, close co-operation and mutual trust and service. This is the only way. All else has failed. My friends, unless man can do this, man on this Earth will cease to be. I threaten not, but simply state the truth. There is but little time left to restore the balance of nature and the world. Fundamentally, what [Maitreya] will say we already know – and accept to be true – which is that right human relationships are the basis of life. From moment to moment, by our thoughts and actions, we set into motion causes, the effects of which make our life what it is, for good or for ill. This is the great Law of Cause and Effect. When we understand this Law and its relation to the Law of Rebirth, we will come to understand the need for harmlessness in all relationships. The rightness, the inevitability, the “commonsense-ness” of right relationship will be driven home to us. On all fronts the obstacles to progress will be tackled one by one: the greed and selfishness so prevalent today will give place to a broader view of community; the basic needs of all will take priority; the new concern for nature and environment will be embodied in legislation, universally accepted, and will lead to a wise husbandry of nature’s gifts; international travel on a massive scale will reduce the isolation and prejudice which narrows the vision and keeps in ignorance so many millions today; the hold on men’s minds of the old ideologies will gradually weaken and give way to a new tolerance and trust. Such is the pressure under which humanity lives today that only the few can perceive the transformations which, daily, are occurring on a global scale. A momentum of change has been established which naught can halt or deviate. Thus it is that the world is undergoing regeneration, purification and pain, preparatory to the creation of an entirely new civilization. The new civilization will be built upon the foundations of the past, but, necessarily, much of the old must be swept away, corrupt and useless as it is. For those with eyes to see, the new indications are already evident. Wherever men turn their eyes today, a new landscape presents itself, new ideas engage the mind, new structures take tentative shape. A world in flux is transforming itself, the growing pains of change are felt by all. Into this situation has come the Christ, eager to assist men in their hour of need. That He can help there is no doubt, but men must want the changes He will advocate and implement them of their own free will. Naught will be forced and naught imposed, for otherwise the Law would be infringed. The speed of change will be conditioned by men’s capacity to absorb the measures for which an ailing world cries out: sharing and justice, co-operation and acceptance of the rule of law. Only thus will men find the peace for which the peoples yearn. These are the minimum requirements for a stabilized world and will become the main responsibilities of governments everywhere to ensure. Simple as they are, their inauguration will have far-reaching effects, and will usher in a new era for this Earth. The creation of weapons of war looms large in the priorities of many nations today. From this time forward, these new priorities must take precedence, and engage the resources now given over to ‘defence’. When this is done, a great creative wave of joy will sweep across the planet and men in every nation will respond. Co-operation and sharing will become the order of the day, and peoples everywhere will find a new purpose and meaning in their lives. Maitreya will be present to advise and guide, and under His wise direction the world will be made anew. This time is now at hand. At least 150,000 people marched in Berlin on 10 October 2015 in protest against the Transatlantic Trade and Investment Partnership (TTIP) free trade deal between Europe and the United States that they say is anti-democratic and will lower food safety, labour and environmental standards. An alliance of environmental groups, charities and opposition parties said 250,000 people had taken part in the rally against free trade deals. “Never before have we seen so many people take to the streets for this issue,” said the German trade union confederation DGB, which helped organize the protest. Several trains and more than 600 buses had been chartered to transport protesters to the capital. Marchers banged drums, blew whistles and held up posters reading “Stop TTIP” and “TTIP signals climactic shipwreck” and “Yes, we can – Stop TTIP.” A group of protesters dragged a giant wooden trojan horse – a reference to the Trojan horse of Greek legend – to demonstrate how the trade deal is being sneaked into law by corporate lobbyists and EU officials through subterfuge. Opponents say the deal will lead to widespread deregulation and bring real democracy into jeopardy, reducing the scope of government. “We are here because we do not want to leave the future to markets, but on the contrary to save democracy,” said Michael Mueller, president of the ecological organization German Friends of Nature. Talks on the pact between the US and 28-nation EU – which would be the world’s biggest trade deal if completed – began in 2013 and the two sides aim to conclude them by 2016. Campaigners are particularly angered over Washington’s insistence that as part of the pact, private companies be allowed to sue governments before special tribunals. Protesters also took to the streets of Strasbourg, seat of the European Parliament. The demonstration was called for by members of the protest group “Stop TAFTA” (the French acronym for TTIP) which comprises 142 associations, trade unions and other groups. An ‘international day of mobilization’ against TTIP also saw demonstrations in other European as well as American cities. Protesters oppose what they see as a lack of transparency in the negotiations. Some claim the treaty would have harmful consequences for citizens. Many people are alarmed at what they see as the potential environmental and health hazards of the establishment of a liberalized transatlantic trading regime, claiming in particular that food and environmental standards are not the same in the EU and North America. But beyond concerns about the practical consequences of TTIP for daily life, protesters also emphasized worries about cultural issues arising from the treaty. “We do not want an Americanization of our society”. “The transatlantic treaty could mean not only the end of the European social model in the face of American monopolistic and ultra-capitalist practices, but could also put at risk a certain vision of culture, which for us in Europe is more than just a commercial product,” he said. A new round of TTIP negotiations should start in late October. Brussels and Washington want to conclude an agreement by the beginning of 2016. TTIP, if ratified, would be the world’s biggest trade agreement, affecting nearly 60 per cent of global economic output and reaching into a market of 850 million consumers. “All refugees are welcome, whether their flight be due to war, persecution or other causes,” a spokesman said as the marchers wound their way down the central Mariahilferstrasse thoroughfare before coming to a halt outside parliament. Austria has been a key transit country for many refugees reaching eastern Europe. There was the usual discrepancy between estimates of the size of the demonstration: organizers said their bid to show public solidarity brought some 60,000 onto Vienna’s streets, while the police put the total nearer 20,000. Along Mariahilferstrasse there were some 2,000 portraits of migrants in order to “put a face to the figures” of the thousands who have streamed in over recent months after transiting through neighbouring states. Thousands of people attended an anti-austerity demonstration outside the annual conference of the UK’s governing Conservative Party in Manchester. Around 80,000 took part in a march with a diverse collection of people demonstrating against the severe austerity cuts, which the Conservative government are implementing. On 25 September 2015 the 193-member United Nations General Assembly formally adopted the 2030 Agenda for Sustainable Development, along with a set of bold new Sustainable Development Goals (SDGs). The Agenda comprises 17 goals and 169 targets to wipe out poverty, fight inequality and tackle climate change over the next 15 years, and builds on the work of the historic Millennium Development Goals (MDGs). The Summit opened with a screening of the film The Earth From Space, followed by performances by UN Goodwill Ambassadors as well as the youngest-ever Nobel Laureate, Malala Yousafzai, with youth representatives as torchbearers to a sustainable future. On Saturday evening 60,000 people crowded into Central Park for an evening of music and activism. Many celebrities and world leaders also contributed to the Global Citizen Festival, including Stephen Colbert, Leonardo DiCaprio, Malala Yousafzai, UN Secretary General Ban Ki-moon, Vice President Joe Biden and First Lady Michelle Obama. Tickets to the event, were free, but could only be obtained by activists and volunteers. Pearl Jam lead singer Eddie Vedder told the crowd during the last set of the night: “Never before have we played to an audience 100 per cent full of activists. What a … day this is.” The event was broadcast worldwide. On 26 September 2015, the UN project ‘Mobilizing Generation Zero Hunger’ was launched, aiming to mobilize young people to champion one of 17 Sustainable Development Goals (SDG 2): ending hunger, achieving food security and improving nutrition. The event brought together young entrepreneurs and activists from around the world with global leaders, policy makers, to discuss how their generation can help make zero hunger and sustainable development a reality.